Dr Elisabeth Rushworth, Dr Catherine Cropper and Dr Helen Vaughan received their award at the Merchant Taylors’ Hall in London. A team from the University’s Central Teaching Laboratory has been awarded a Higher Education Academy’s (HEA) Collaborative Award for Teaching Excellence (CATE). The new CATE award, being piloted this year, recognises teaching excellence by teams at higher education providers. The collaborative award reflects the key role that teamwork has in promoting student success through learning and teaching. The CTL were announced as winners at a ceremony held at the Merchant Taylors’ Hall, London. At the same ceremony, Dr Susanne Voelkel also received her National Teaching Fellowship award. 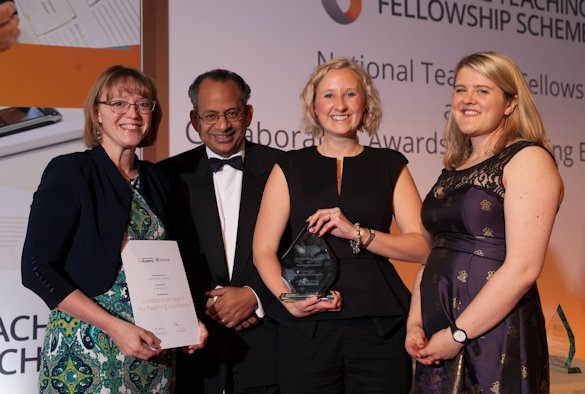 The CTL comprises Geologist Dr Elisabeth Rushworth with scholarship interests in internationalisation and interdisciplinary team work, Dr Helen Vaughan, a physicist with interests in embedding employability skills through in-curriculum and co-curricular learning experience and Dr Catherine Cropper, a chemist who specialises in digital laboratories and engaging parents and children in STEM. HEA judged the CTL to have had impact on departments across the university, supporting new pedagogies in large group teaching, improved delivery of employability skills and the introduction of cross disciplinary modules and multi-disciplinary dissertation projects. Together they have developed and embedded the collaborative “Educational Broker Model” at Faculty level. As educational brokers they work with academic and technical staff in discipline specific departments to develop and support teaching and learning in CTL. Fifteen institutions were shortlisted for the award. Six of these institutions were awarded grants of £15,000 to disseminate their learning, including the University of Liverpool.